My player is Yueer Cindy Feng. E-9 on the back and done by noon. First off tomorrow on the same side. Perfect. Three times a charm? 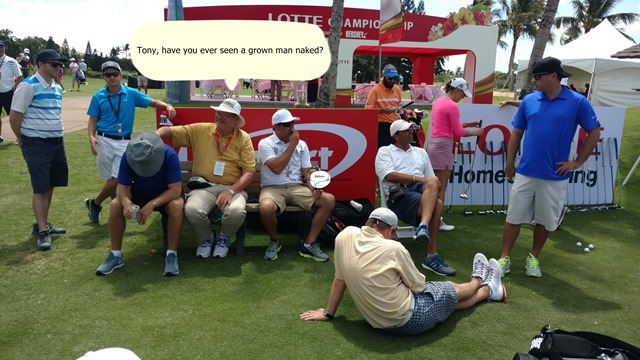 Not on the LPGA. Cindy applied for my caddie credential before the Ocala event and the spelling of my last name was incorrect. I was told it would be fixed by Phoenix but that badge was wrong also. Yesterday she gets an email saying my new badge is in. Again, same misspelled name. It’s not Smith. The caddie bib deposit has doubled since last year to $40 since some weren’t returned. An email from the LPGA said the towel was included with the bib but not so. The guys in the caddie tent said that was news to them. That’ll be another $5 please. This entry was posted on Tuesday, April 12th, 2016 at 7:13 pm and is filed under Uncategorized. You can follow any responses to this entry through the RSS 2.0 feed. You can leave a response, or trackback from your own site.